Since the build time, cost, and repair time has increased in this came, why are there "no" better coin offers to offset this? 11,000 coins does not go far in this game anymore so why is that more isn't being offered for this insane price? No thinking outside the box with kixeye marketing guys. They could have made a lot more money if they actually used their heads and not be like **** sheep. Also do they have to spam the **** coin offers every single **** time I go to my base !!!!!! at least make it a max of say 5 times in each log in. Each time that coin offer on base view comes up a giant fist should punch the guy responsible for it in the face !!! he might wake up to the annoyance of it then. working as intended. to f/u/c/k/ us over and to annoy us till we get it. it dont bother me to much cuz im always in sector or planet view when im on. when i get on, i do what i need to in base view then dont go back. but ya i have got this last coin deal but mistake by falling asleep and my hand relaxing on the botton then when i woke up and griped the phone it scanned my finger print and made the perches and they wont give me the money back. so ya its annoying as ****. I have a few accounts... one account gets a offer the others do not get... its some hulls (changes) and 18,000 coins for 100$. ANybody see those or similar? Yep, I've been away from this game for a year. I installed a few days ago and received over two days different offers. 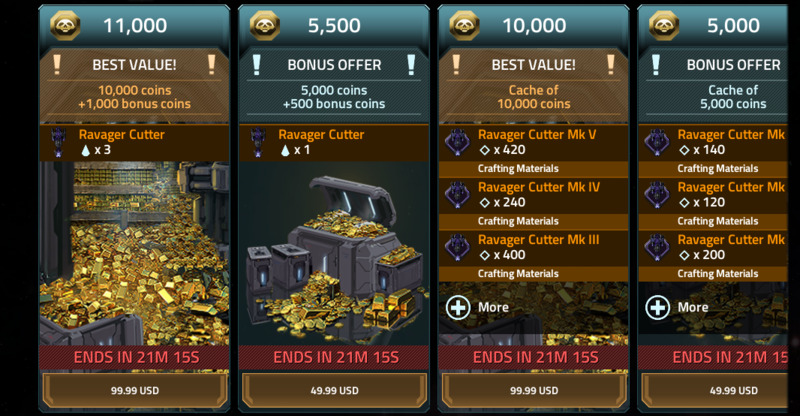 The most interesting one was 3 prebuilt Bastion cruisers + 18,000 coins, that I'll consider to buy or not if does it appears because I don't have anything of the Altarians tech. Basically, it's because. . . . . coins.